Welcome to the Law Office of David E. Babson, Esq. 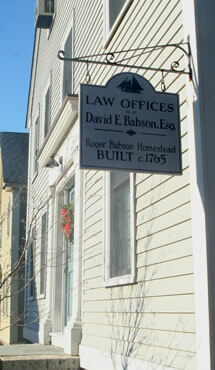 David E. Babson Attorney at Law, has been serving Essex County, Massachusetts including Gloucester, Rockport, Essex and Manchester by the Sea, since 1974. Attorney Babson believes in the three A’s: Ability, Availability and Affability. His prompt, attentive and intelligent response to your concerns is the cornerstone of his practice. 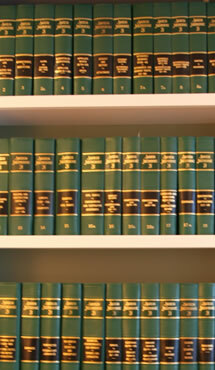 Mr. Babson believes that his clients should be kept informed at each stage of any legal proceeding and be given the opportunity to be educated so he or she can make the best possible decision under their circumstances. You will feel secure with Attorney Babson. With over 35 years of experience as a trial lawyer, Mr. Babson has served a broad spectrum of clients in both commercial and private legal issues. Attorney Babson offers free initial consultations, either over the phone or in the office. To schedule a free initial attorney consultation call (978) 283-5759 or email our full service law office in Gloucester, Massachusetts.